In 2369, [as recorded in Yalkut Shimoni] Moshe Rabbeinu completed the Mishneh Torah and was told by Hashem that his petirah was near. In 5109/1349, a plague killed hundreds of Yidden in the kehillah of Worms, Germany. In 5242/1482, the first printed edition of the entire Chumash with Targum Onkelos and Rashi was published in Bologna, Italy. In 5576/1816, the final expulsion of the Jews of the city of Lubeck, Germany, took place. This was 117 years after they were expelled the first time. Harav Daniel Prustitz was born in 5519/1759. His father was Harav Binyamin Wolf. Rav Daniel was a talmid of Harav Meir Berabi, zt”l, the Maharam Berabi. He was very close to the Chasam Sofer, and appointed Rosh Beis Din in Pressburg. He taught the young bachurim, concentrating on the correct derech halimud. While still young he learned Torah in depth, and was also known for his tzidkus. He fasted often, and was particular to observe every minhag with all its details. With his yiras Shamayim and yiras chet, Rav Daniel was always concerned lest he hadn’t performed the mitzvah completely. Rav Daniel was considered by many in Pressburg their spiritual guide and benefactor. People asked for his advice about all their problems. He was very generous when informed of unfortunate cases of widows and orphans, giving these families far beyond his financial ability. Although he was offered more prestigious posts, Rav Daniel was not looking to gain financially from his Torah, and preferred to stay on in Pressburg. In his later years, Rav Daniel gave a daily Gemara shiur to the Chevra Shas, never missing one; he delivered the shiur until a few days before his petirah. Rav Daniel was niftar on 6 Adar 5606/1846. He was buried near the Chasam Sofer. 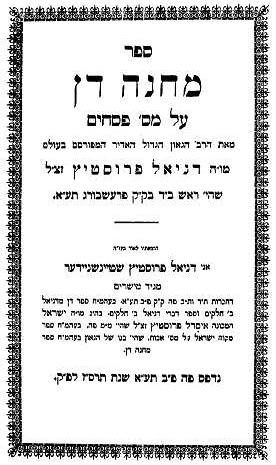 His chiddushim on Maseches Pesachim were published as Machaneh Dan. In 1945, President Franklin D. Roosevelt, British Prime Minister Winston Churchill and Soviet leader Josef Stalin signed the Yalta Agreement, in which Stalin agreed to declare war against Imperial Japan following Nazi Germany’s surrender.